A little motivotional wallpaper made by me after being remembered of this excellent text from Frank Herbert’s Dune. The Bene Gesserit was an awesome concept… almost a kind of Jedi. I wish someone could make a decent Dune movie… except for Michael Bay. Odrakir — I believe the notation above means this fantastic image & the Litany Against Fear may be shared. May we use it for an illustration in an article I’ve written, soon to be published? How should we attribute it? Hi Ann, thanks for visiting. 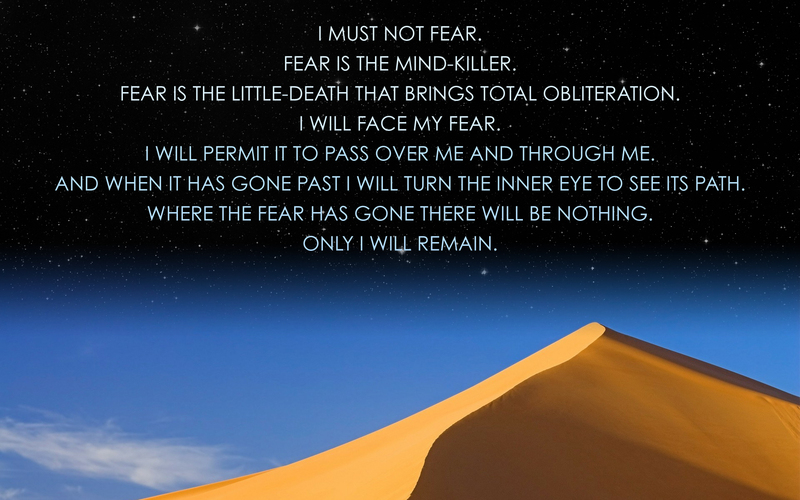 Litany Against Fear is from Frank Herbert’s Dune, that’s how you should attribute it 🙂 I just used his fantastic text to create the wallpaper. Feel free to use it. Cheers! THANK YOU so much for your quick reply. My editor will be ever so grateful. Do you want a copy of the article when it comes out? It’s about the ‘real’ behaviors that bring on what is called PTSD — only what I found out was deeply moving, especially as concerns women who serve on the front. I’ll need your actual email addie. Would you mind this image being used as a Facebook cover photo? It is one of the loveliest graphics that I have seen for one of the most powerful thoughts expressed in Herbert’s work. I would like to use it for a time, but I would only do so with permission. Thank you for the excellent image, in any event. Sure, no problem 🙂 Thanks! Next PostNext Say “Kiss me”.